Marriage is not a noun; it�s a verb. It is not something you get. It is something you do for your partner to make him/her happy. It requires love and sacrifice the most.But what if a marriage is based on a contract and requires something which is unaffordable to confer?Areesha always considered marriage as a contract of just exchanging love..Sooban believed that everything can be sacrificed for love and asked her wife to sacrifice our baby for his sister..It feels really dreadful to know that Rabia can never have a child; and that is why I own my brother�s baby.Zubaida is a dominant woman; and she will make sure that her son gives his child to her daughter.Talat will always stand by his wife�s decision.Since then she is finding reasons to feel complete but somewhere inside she still feel that she is Incomplete..! 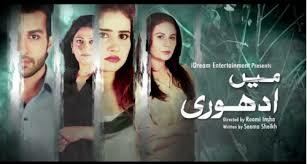 !Writer: Seema ShaikhDirector : Roomi InshaCast:Saniya Shamshad as AreeshaAzfar Rehman as SoobanNausheen Shah as RabiaHassan Niazi as Basar ShaourSaba Hameed as Zubaida MansoorTalat Hussain as Mansoor HassanAyesha Toor as RubabKhalid Malik as EhsanHira HussainShehzad MalikIsmat IqbalKaif GhaznaviAdnan Shah (Tipu) and others.